Cheap Tools are for Fools! 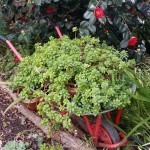 “My garden is chock-a-block with rescued plants, rescued pots & garden furniture, mirrors, birdcages, wheelbarrows, barrel hoops, ladders and all sorts of other bits and pieces. Not only do I collect treasures from the hard rubbish and Op shops. My friends and work colleagues donate things too. 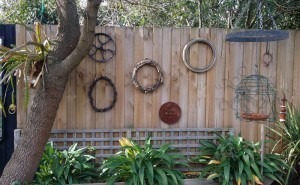 Some are used ‘as is’, others are tweaked, tarted up, assembled or arranged to make them more useful or display-worth.” So says Tine Grimston, from Rowville, Victoria. As well as using recycled treasures, Tine tries to be sustainable in other ways. She is a participant in the local council’s Garden’s for Wildlife program and has fruit and nut trees, a veggie garden, water tanks, solar panels, indigenous and native plants and a pond. She and her partner, Wayne, purchased their nearly half-acre property in 1993. The house was 3 years old, and the garden consisted of grass, several knee-high Hakeas along the back fence and a couple of pittosporums in the front. Starting the garden was a challenge. It was extremely wet during the first year so that venturing outdoors required gumboots and necessitated drainage works. Since then the main battles were drought, regular frosts in winter and spring and a soil structure of compacted clay and builder’s rubble. In summer, cracks in the ground large enough to put a fist into opened up. With such a large area of lawn to mow the quantity of grass clippings was enormous. 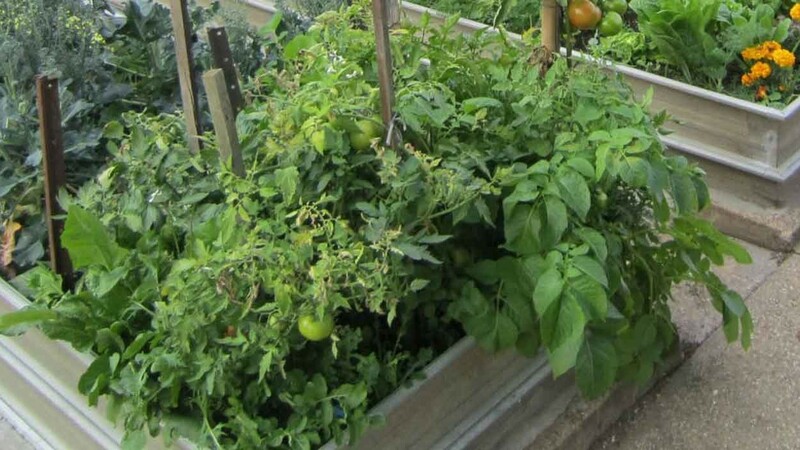 Thinking that there would eventually be garden beds along the extensive fence-line which was shared with six neighbours, they piled the clippings there to form the beginning of a soil improvement program. As time went by, the grassed area has diminished with every new garden project. They wished to have pleasant views from all windows, so began with a garden bed along the fence-line that was visible from the living area. 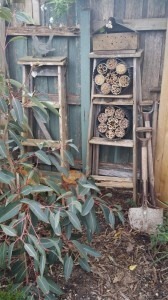 They planted out wheelbarrows with succulent cuttings, and started collecting old wooden stepladders to give height to a new garden bed. Five of the six fence sections have been replaced with higher fences in the last two or three years, so there is a further need to find ways to hide them. Concrete reinforcing wire rather than plastic lattice has been used and Ivy Leaf pelargoniums made a quick cover. 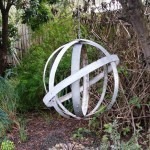 There is no overall design for the garden – it has developed in fits and spurts as time, money and inspiration have allowed. 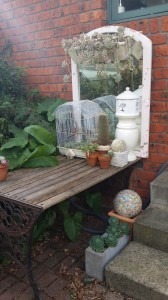 Influences were the need to incorporate some great gifts (the gazebo, a garden arch, two huge terracotta pots, new gates to replace the closed-in wooden ones) and some great roadside finds (mirrors, birdcages, ladders, wheelbarrows, pots, garden furniture). 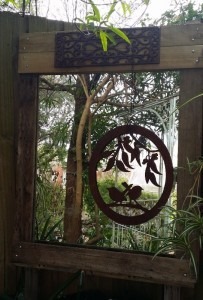 Tine joined the Dibble and Hoe Garden Club about 10 years ago and the beautiful gardens of members have been inspiring. 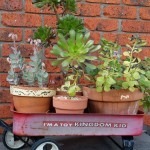 Plant swaps have been source material for much planting. There is a large central lawn surrounded by flowerbeds to the north of the house. All the paths and garden beds have curvaceous, serpentine edges. The rear of the house faces west and gets the full afternoon sun. 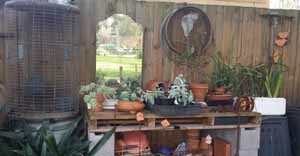 This part of the garden has a pergola draped with Wisteria and Bougainvillea to shade the windows, a pond, gazebo, circular veggie garden, potting and composting areas and a number of fruit and nut trees. The south side of the house has a curving sawdust path, with a ‘geranium wall’, a herb garden and additional fruit trees.